Before I get started, let me say this: buying and caring for a dog is a big responsibility. Although there are ways to save money when purchasing a dog, I don’t want anybody to believe that they should be “bargain shopping.” It is fine to search for the best deal on vet care, food, and toys. But when it comes to buying an actual dog, you want to do your research to ensure that you get the right pet for your family at a price you are comfortable with. Also, this post is not to advise against adopting a dog from shelters; it is specifically written for those who have decided that they want to buy their pet. 1. Negotiate. Who would negotiate on the price of a dog, you may ask? While this may sound silly on the surface, it is something that you should be doing no matter if you purchase at a pet store or a breeder. No matter the seller, they are going to have a price in mind. It is your job to “talk them down” if you are interested in saving money. Unfortunately, there is no “going rate” for dogs. It is often times difficult to look at the market and make an accurate determination on what you should be paying. For this reason, all you can do is feel out the seller and work together to decide on a price that is mutually acceptable. 2. Shop around. This can be the most difficult way to save money because you are dealing with a pet, not an inanimate object. It is easy to become attached to one dog in particular, and you may therefore not want to visit another breeder or pet store for price comparison purposes. This is why you should attempt to gather as much information as you can before visiting any location. For instance, you could call several breeders on the phone for an idea of how much they are selling their puppies for. This way, you can first visit the breeders that are offering the best price. This doesn’t mean that you have to buy, but if price is on your mind it is a good starting point. 3. Breeders are almost always cheaper than pet stores. 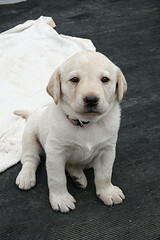 Early in the year, I spent several days with a friend who was searching for a Labrador Retriever puppy. In our part of the country, these dogs are very common. Not only are they sold in pet stores, but there are breeders from one side of the city to the next. Soon enough, I realized a huge discrepancy in price when comparing breeders to pet stores. Most breeders were asking between $500 and $1k based on the lineage of the puppy. For example, those with championship bloodlines had a higher price. Pet stores, on the other hand, were asking anywhere from $1,800 and up. As you can imagine, he ended up purchasing through a reputable, local breeder. Not only did the breeder have more puppies to choose from, but the price was three times less than the closest pet store. This is party because pet stores have much higher overhead costs to account for than breeders. Don’t buy a dog just because it is cheap. Instead, do your homework to determine which breed is right for you as well as your options for breeders and pet stores in your area. From there, you can use the advice above to save money. Do you have any tips on saving money when buying a pet? Does the very idea of trying to save money bother you? I have never thought of buying a dog, but I can't help but comment because my dog has been such a bargain. I think buying a dog would be risky, because money is involved and you just don't know what you are going to get. Acquiring a dog is risky, but putting money on the line as well is probably why it never occurred to me to do it. I guess if you are particular about breeds, you might want to buy a dog. When my daughter moved out 15 years ago, she thought I would have "empty nest syndrome". Hehehe. Didn't happen ;) But she encouraged me to get a dog and we went to the animal shelter together to adopt one. I chose the dog that didn't bark wildly when we came into the room. She looked sad and hopeless. I actually didn't think she knew how to bark for awhile, but of course she proved me wrong. MaggieMae is 15 years old now, and she was 7 months or so old when I got her. She has been healthy and not at all expensive. Besides her regular food, I buy her fancy FreshPet Select food as a treat, because she practically dances for it. I tried it for months for free because the company distributed coupons for free product, and we had access to many newspapers. No way could I make her give it up when I finally had to pay for it! Her good health is probably the main factor in her low cost of living. I avoid vets unless there is a reason to use them, which basically means vaccinations that are required by law. Too much or unnecessary medical care, for humans or animals, can be counterproductive, useless or fatal. Also, her basic food is Purina Dog Chow. I found that other everyday foods made her sick, and I don't think that specialty brands are anything more than a marketing ploy. It is big business to exploit the love owners have for their pets, but not necessarily based on what is good or best. Vets may promote certain dog food brands, but that is like Tylenol becoming accepted because the company gave their product to doctors and hospitals to dispense. Adoption is the way to go! When you adopt you're saving a life and providing a much-needed forever home. When you buy from breeders or pet stores you're often supporting an industry of cruelty and adding to the pet overpopulation problem. Adoption is also affordable. I paid a fee of $329 for my dog which included neutering, microchipping, and a free general exam, and he was worth every penny and then some. He's my baby and my best friend, and having him as a member of the family is priceless! I bought my lab from a person who was advertising in the paper. Yeah, I know, I used an actual newspaper, what used to be before the internet. Anyways, I didn't care too much if I was getting a prized puppy, but I did go and check it out. The home seemed pretty legit so I picked my dog out for like $200. Not bad for a golden lab (mom was black dad was yellow lab). I think just thinking about and actually sticking to your dog buying budget is key. Of course adopting is more inexpensive, but sometimes you are set on a particular breed and age. So, in the end, do what is best for you. We bought our dogs a few years ago from a small breeder. We didn't pay too much for them, but you wouldn't believe the crap I got for not adopting! Whan an effed up post. Seriously? Have you never seen Animal Planet save the breeding dogs or heard of puppy mills or something? Never never never get the cheapest puppy you can find. If you are at a place that will bargain down puppies, that it isn't where you want to buy a dog!!!!! If your "breeder" is even cheaper than the pet store, yikes! The cheapest option is close to free. Your humane/breed rescue society. Backyard breeders can be truly evil people who use money from cute baby animals to torture the adults. It is your responsibility, as a human, not to put that suffering on an animal. This article is just irresponsible. It does matter where your animal came from and what kind of conditions you support. Also, as with most things in life, you get what you pay for with breeders. And, well, I guess you'll have to imagine where those pet shop puppies came from because you obviously didn't do so much a Google search to research this article. Nice informative post. Dogs are becoming expensive as new breeds starts to be acknowledge and the benefits of having this kind of pet was becoming widely accepted. Having to plan ahead the acquisition of new pet simply requires the basic step of preparation of both financial and personal obligations. It's definitely a good idea to know what you are looking for in a dog, even if you are just going after a mixed breed. We adopted a Border Collie "mix" and she was THE HIGHEST NEED dog I've owned in my life. We got her when we lived in the city and the only thing that would keep her energy level at normal was to take her on daily long fast 2-4 mile runs, which could only be achieved by the human riding a bicycle at neck breaking speeds. Maybe she had some greyhound in her as well. Anyway, it taught me a lesson that I'll never forget. I was always scared to death to take her on a run because I'm not too good of a bike rider as it is and she wasn't the straightest runner. It was such a relief when we moved out to our little acreage in a rural area which was completely fenced because then she could run all day long on her own, which she did. Looking back on it, I wish I'd known about Cesar Milan's Dog Whisperer techniques because I think I could have settled her down a bit, although he does advocate lots of daily exercise for dogs.